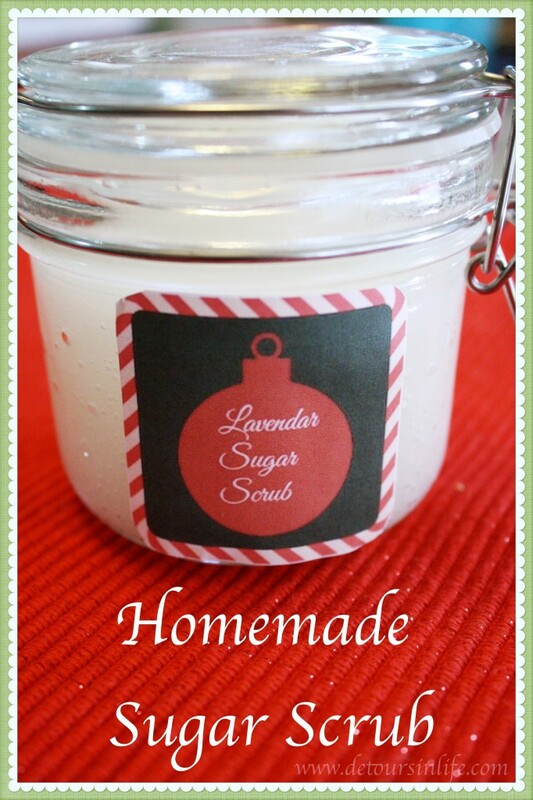 This is an easy way to create your own sugar scrub at home and a great gift idea for the holidays. The possibilities for customization are endless with the type of oil you use and the scents that you choose. I made this with what I had on hand, baby oil and lavender essential oil. You can use Olive Oil or Coconut Oil and other scents like citrus peels, citrus oils, vanilla bean, and others. Make sure the oil you use is high quality as this will remain on your skin. The possibilities are really endless on what type of sugar scrub you want to create. This is one of the best ways to exfoliate your skin while in the shower or bath. Just make sure to wash out the oily residue so the next person in the shower/bath doesn’t slip as this does make it a little slick. To use, I keep mine in my shower and open the jar, swirl to mix the oil with the sugar, and then apply a generous amount in your hands. Rub on the areas you wish to exfoliate like legs, arms, or feet. Rinse well! Towel dry and enjoy your moist and soft skin. Combine all ingredients in a bowl and mix well. Store in a glass air tight container. It is not advisable to store in plastic containers so I found some inexpensive glass jars at Hobby Lobby. You can also use a similar jar that is available at Amazon. I created the label at Picmonkey and then printed it on clear sticker paper to place on the jar. If you are going to keep the jar in the shower, you may want to get water proof labels. *This post may contain affiliate links. Clicking on those links might earn a commission for this site which is used to keep the content free. For detailed information, please check my Disclosure policy. This is a super cute idea! I already have all the ingredients, too. I’m a big fan of essential oils now. Thanks for sharing. I am a fan of essential oils too. I use several of them in making my own cleaning liquids for the kitchen, bathroom, and floors. Thank you for stopping by! I love sugar & salt scrubs. Nothing makes your skin feel smoother. Thanks for this. I will have to try making my own. It is so easy that I don’t know why I didn’t think to make my own a lot sooner. 🙂 Let me know how it turns out for you. This sounds great for winter! This is a great idea. I have several cousins that I want to get a gift for and am out of money so this would make a great reasonable gift! I love homemade gifts and this one is perfection! I love that it can be customized too! Thanks so much for sharing and linking up to Thrifty Thursday this week! What is the best oil to use? I’ve seen several different kinds in different recipes. Thank you for stopping by Amy. I would use good/organic coconut oil if I had some at the time. If I need to make some up and I don’t have any coconut oil, I’ll use olive or baby oil even. Thank you for sharing this sugar scrub recipe! This would be just the thing to help me relax after taking care of my girls all day. It looks awesome! How easy is that! Thanks for sharing! Thanks for linking up with the Bloggers Brags Pinterest Party. I have pinned your post to the Bloggers Brags Pinterest Board! do I melt the oil before mixing? Thanks for sharing this last week at The Wednesday Roundup, make sure to come by and grab your FEATURE button! Congrats! Thank you so much for the feature Christine! I grabbed a button and will be sure to link up again in the future. 🙂 Thank you for stopping by! OOOhhhh love it! Could be a great last minute Valentines gift too! Stopping by from SITS. Your blog is beautiful! #SITSblogging.